From under blue, October skies and rows of colorful, canvas tents, photos will flow this week from Hip Donelson Farmers Market, in Nashville, TN! Hip D – as the market is affectionately referred to by its local patrons and vendors – is next up to take over FMC’s Instagram account. We caught up with volunteer, Maggie Sidlinger for a little Q&A about what makes Hip D Market hum in the land of music. Farmers Market Coalition: Give us a little history on Hip D.
Maggie Sidlinger: Our market is in its 4th season, starting in 2012 after the community pushed for a farmers market in our neighborhood. A group of volunteers from Hip Donelson, a community non-profit, came together to plan and organize the first market in mid-summer 2012 – starting with only a handful of vendors. Since then, we’ve grown to almost 70 vendors! Hip D is a producer only market, with all our vendors traveling to us from within 150 miles. We are 100% staffed by a group of dedicated volunteers, who work many hours each week to make our market happen. Through vendor fees and market/community merchandise sales, we’re able to support many organization and events in our community. We’re an outdoor market, centrally located in Donelson – a neighborhood of Nashville- and operate on Friday’s 4-7pm, May – October. Being on Friday afternoon/evening, our market is the perfect way to kick off a weekend. Each week, we provide live music and invite local food trucks to our market, which contributes to our festival-like atmosphere. FMC: How does Hip D generate excitement for its market within your community? MS: Since the beginning, we’ve always had live music – Nashville is Music City, after all! During our 2nd season, we worked with community sponsors to offer a SNAP benefits program to purchase fresh fruits and veggies, doubling benefits up to $20 per market. Our successful “SNAPback” program is one of Hip D’s biggest accomplishments. During 2014, our vendors recorded $16,000 in SNAP sales and our customers received over $12,000 for “SNAPback” purchases! As October is the season for greens, we hold our annual Potlikker Festival (for those not familiar with potlikker, it’s the broth left in the pot after cooking down greens). The idea for the festival began with wanting to create a celebration unique to fall and tied to traditional southern foods, and has grown this year to include greens, cornbread and bourbon. The festival hosts multiple cooking contests, where local chefs judge the best greens, cornbread and bourbon dishes. A greens contest isn’t something you find in a lot of places, but that’s why we like it! FMC: How do you use social media to promote Hip D? MS: We use Facebook, Twitter and Instagram every week to update our customers on events or market happenings. For us, Facebook is the most effective since it reaches more people, but Twitter and Instagram are extremely useful for reaching customers that don’t use Facebook. We make sure to follow other neighborhood markets and all our vendors on each social media platform, so we can easily share their information with our customers. Doing so helps to generate more exposure for our market, other local markets and our vendors and farmers. FMC: What are you most looking forward to sharing with our Instagram followers? MS: I’m biased, of course, but I really feel like our market is something special. From our volunteer family, our vendors, our sponsors and customers, each and everyone of them brings something to the market, making it what it is. Last year, our last market was on Halloween. It was freezing and the wind was so unruly we couldn’t set up tents. But the weather didn’t deter our spirits. We danced to the music to keep warm, vendors shared hand warmers, volunteers made coffee runs, die-hard customers still came out, and one vendor even ran around in a gorilla suit to make us smile! Although we were miserably uncomfortable, we still had the best time and have the wonderful memories to look back on and laugh about. This is what I want everyone to see about our market – the love and care that goes into it, and the love and care the community gets from it. 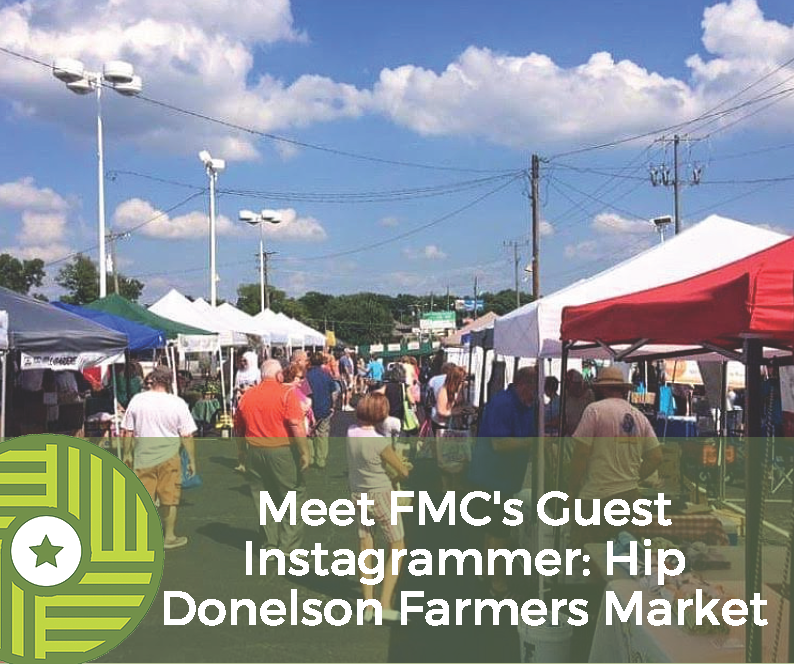 Be sure to follow Hip Donelson’s FMC take-over on Instagram.